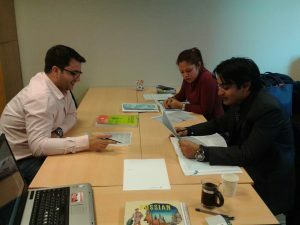 This Russian course is designed for business people who can fit their language lessons only on weekends. The course is structured in modules of five sessions. There is one session on Friday (17:00-19:00), two on Saturday and two on Sunday (10:00-12:00/ 13:00-15:00). The content of this course can be arranged at any level. Students may request a particular line of study to suit their own interests and purpose. Part of each session is a conversational lesson. All General Language Courses are structured in levels comprising 60 hours instruction. Each module is taught by a different teacher, that helps students to understand various styles of speech and make the language learning process close to the real situations. The schedule of the day is based on 3 modules per day, each 2 hours long.